Australia is a stunning birding destination, but with more than 700 bird species, many of which are endemic to the region, it can also be an overwhelming one. 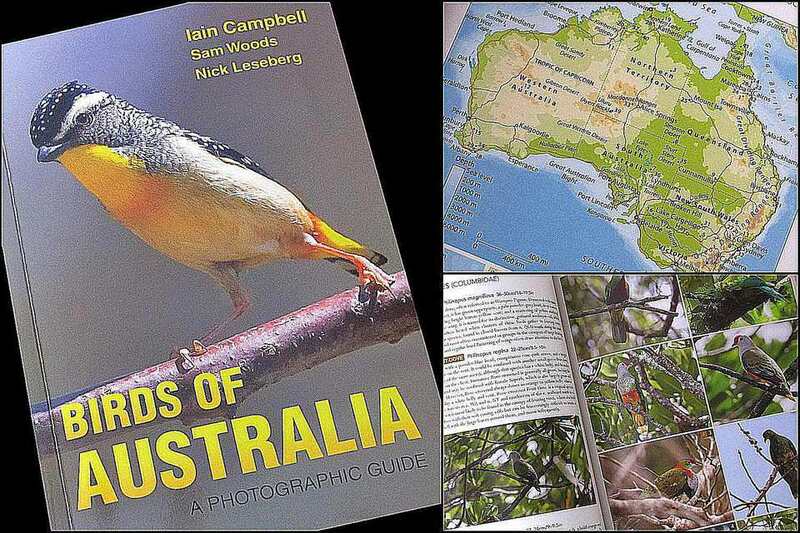 Whether birders are residents familiar with their local birds, just getting started birding or visitors with no experience with Australian species, Birds of Australia: A Photographic Guide is a comprehensive and visually stunning resource. Beautifully laid out and conversationally written, this book is a fantastic companion in the field or just for armchair birding and dreaming of Australia's amazing birds. More than 1,100 photos present diverse, exceptional views of Australian birds, including the surrounding habitat and distinctive behaviors. Book is surprisingly compact considering its scope of coverage, and is still conveniently sized for field use without using unreadable fonts or cramped layouts. Casual tone is easy to read, presenting thorough information for bird identification without overwhelming readers with unnecessary details. Similar birds are grouped together with 3-4 species on a typical page. Some pages have as many as six birds but are not overly crowded. Lacks bold text, photo pointers or other formatting tactics that would highlight key information without reading the full species descriptions. Range map shading can be hard to distinguish, and the maps for birds with very restricted ranges can be difficult to see at all. Does not include suggested resources or additional reading materials for readers to plan an Australian birding trip or to learn more. Lacks any checklist feature for birders who might be interested in keeping a list of the birds they see. Australian birds may seem like a rainbow explosion of exotic species unheard of anywhere else in the globe, but Birds of Australia: A Photographic Guide can be a birder's ultimate resource for learning about the region's phenomenal avifauna. Covering more than 710 resident species and regular migrants, the book offers a comprehensive look at Australia's birds in a way that won't overwhelm even novice birders. To orient birders to this unique birding region, the book has an extensive introduction that begins with a continent map (page 9) with the most popular birding hotspots highlighted. An overview of Australia's climate follows, and pages 12-37 feature discussions of the continent's widely varied habitats. Included in each habitat description are not only the basics of plant life and where the habitats are most abundant, but also which birds prefer each habitat type. Thumbnail maps with each habitat description show where in Australia and Tasmania each region can be found. The details in each profile are selected specifically to show what is unique and distinctive about each species, making identification easier without overwhelming readers with minutia. The photos accompanying each species profile are crisply focused, colorful and attractively composed to show not only the bird but also enough of its habitat and typical behavior to give readers a strong understanding of how the bird will look when it is seen in the field. Photos are discreetly labeled with gender, age, breeding or non-breeding plumage and general location as needed to identify different appearances, including subspecies. Some birds are also shown in flight, especially aerial birds that will more likely be spotted while flying. Small range maps are included with each bird profile, positioned in the outer left margin of each page so they are easy to view. Different degrees of shading indicate different ranges, and it can be difficult to discern the differences between ranges, particularly for birds with limited geographical distributions. In order to help birders better locate individual species, the guide includes a general table of contents (pages 5-6) as well as an index with both common and scientific names (pages 381-391). A list of the book's abbreviations is found on page 374, and a basic glossary of birding terms is included on pages 375-379. Birding in Australia can seem intimidating with so many amazing and unique birds to see, but with Birds of Australia: A Photographic Guide, birders will be well-equipped to not only see but identify and enjoy all the regions stunning birds.